It is a scenario that is on the cards, however, with the three men lined up for moves to Parma, Lazio and Juventus respectively. For Massimo Donati, once of Hamilton Accies, Celtic and St Mirren, not to mention AC Milan, it is an exciting prospect – with five times Ballon d’Or winner, Ronaldo, the main attraction. “If Juventus were to land Cristiano, it would be fantastic for the whole of the Italian game,” said the man who is currently back in his native Italy and searching for a coaching opportunity. “He is the number one. There is nobody like him. Although he is no longer young, he is still the best there is out there. “We have seen this with his play for Real Madrid, and we have seen this with his play for Portugal in 2016 when they won Euros. 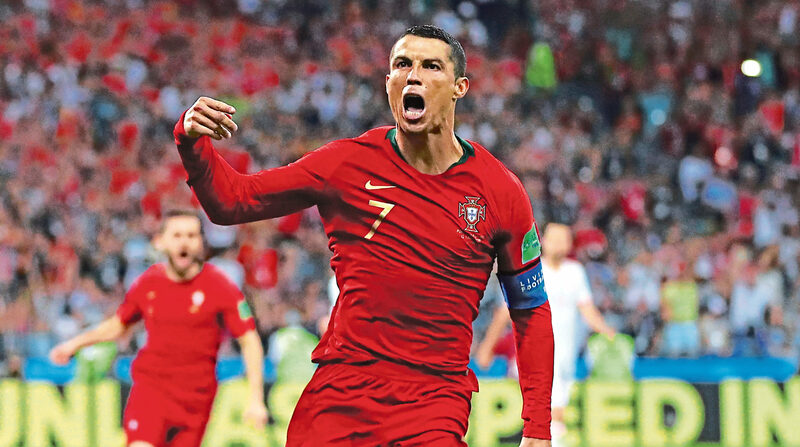 “And even though they did not do so well in this World Cup, Ronaldo once again proved himself to be an outstanding talent. “You consider these things and I would say that, until a month ago, it was unthinkable that he could end up in Italy. It is a deal that Donati believes can in one stroke change the balance of power in the European club game. The reign of Spain – and in particular the powerhouses of Barcelona and Real – has been formidable. But the Old Lady in Turin, like his former employers, Celtic, have a storied history, too. “Juventus are very like Celtic in Scotland,” he said. “Everyone knows them for what they have achieved in football. Not only in the past but today. “Just like Celtic, Juve have won the last seven titles and are very dominant domestically. “Through these successes, they have been able to establish themselves as regulars in the latter stages of the Champions League, and the money this has generated has made them grow stronger and stronger. “Even so, the size of the Ronaldo bid we are talking about (£88m) is huge. It makes a statement in its own right – we want to be the biggest not only in our own country, but in Europe, too. “I certainly hope they can get it done because it would be a deal the whole of the world game would take note of. “From a personal point of view, I would love to see how Cristiano copes with the Italian defences. Defences which look set to include two faces familiar to fans of the Scottish game. “Dedryck Boyata is a good player, who I think Lazio would not regret signing,” said Donati, who has watched the Roman club follow the Hoops defender with interest, and reckons they could still land him despite strong interest from Fulham. “He is a real physical specimen, which gives him an advantage. “Defensively he switches off too often in games, which is something he has to improve on. “Overall, I thought he did very well at Celtic and I think he should be suited to Serie A because, as well as his physique, he also has great feet. The same, Donati reckons, can’t be said of Bruno Alves. “Alves to Parma makes sense to me because he’s no longer a kid and last season he did not do very well with Rangers,” he said. “However, it was not just his fault. Everything went wrong at the club and there was so much confusion. “In these situations, it would be difficult for any player to make an impact. “Parma are a young team, who are coming off of successive promotions. So there is certainly a need for someone bigger, with experience. Alves, as someone who was part of the Portugal team which won the Euros, certainly fits that bill. “If there is a doubt it is that he is 36 years old now. It remains to be seen if his physical condition is good enough to face a tough and demanding championship like Serie A. “If it is, then he can do well because he is a great player. Donati is also intrigued to see how Rangers do in the absence of Alves, not least because of the man they now have in Steven Gerrard in at the helm. “Gerrard is a great name. As a player he made so much history with Liverpool and England,” said Donati. “Now he is at Rangers and, even speaking as a Celtic fan, I hope they can come up a level under his management. “To watch them put out of Europe last season by Progres Niederkorn, a team of part-timers from Luxembourg, was a really a sad and unedifying thing. “This week their European adventure begins again with the tie against FC Shkupi of Macedonia, who I don’t expect to give them many problems. “So I expect them to go through, and I believe in the domestic competitions they will be stronger. It is an environment which Donati knows only too well. A £2m signing by Celtic from AC Milan in 2007, he spent two years with the Hoops, most famously netting a last-gasp Champions League winner against Shakhtar Donesk, before returning to Serie A with Bari. Then in 2016, he returned with Accies, making 41 appearances and taking his first steps on the management ladder by coaching the Lanarkshire club’s Under-15s. Now aged 37 and finished with the playing side of the game after an unsuccessful cameo at St Mirren, Donati would love to be pitting his wits against Gerrard and Brendan Rodgers as the manager of one of Scotland’s other Premiership outfits. “Coaching is my dream and I will give my all. It is fantastic to play the game but, at my age, this is now a closed door for me,” he said. “My brain knows what I should be doing, but I am just not able to run after the kids who I would be up against. “So I have to look to be doing something else, and I would like to do so much is to train the players of the future. “I do not sleep at night. I remain awake for hours thinking about patterns and game situations. “I know it will not be easy to find someone who will be willing to trust me because I’m a rookie.